Midwest II's monorail system is black cathodic epoxy electrocoat. Cathodic epoxies are the benchmark for corrosion resistance, throwpower, and operational reliability. 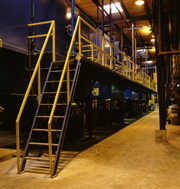 The process utilizes a monorail for parts transfer through an eleven (11) stage pretreatment system for parts cleaning (including a micro crystal zinc phosphate stage), an electrocoat bath (using OEM approved paint), post rinses, dehydration tunnel, curing ovens, and load and unload areas. The monorail line contains unique part racks for conveyance through the process. It is configured in a flexible manner that facilitates simultaneous production of different size and shape parts in different rack locations for multiple customers. This is advantageous to our customers when rapid turnaround is required. This line handles small to medium size parts, with a maximum size of 42 x 48 x 72 inches. In the Cathodic electrocoat process a DC rectifier applies a positive electrical charge to paint particles suspended in a bath of non-conductive water. The positively charged paint particles are drawn to the negatively grounded part, resulting in their deposition. At coating thickness, the film insulates the part so attraction stops and electrocoating is complete. Midwest II's process also includes a large capacity waste water pretreatment system for processing prior to discharge. System 'uptime' is of critical importance in meeting customer commitments. 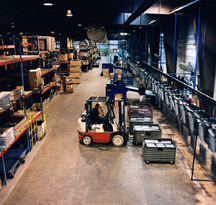 Midwest II stocks, on the premises, a substantial inventory of equipment designated as backup in the event of an emergency or component failure. In addition, daily maintenance tasks are computer generated based on a program that contains equipment and component life cycle history. Our maintenance program is both predictive and preventive and 'uptime' is consistently over 99%.